Fans of online slots are well aware of the fact there is no need to look far in order to come across an online slot that was inspired by superhero stories. Video slots based on superhero comics are the latest craze among reel fans which can be easily explained with their enhanced graphics, engaging animations, and seamless gameplay. It matters not who your favorite DC superhero is, chances are you will find an online slot based on their story. Following the release of various blockbuster movies in the past few years, some of the most praised software providers in the industry have introduced a number of enticing slot titles that are also based on stories from the iconic Detective Comics or DC Comics series. Each DC Comics slot is unique and has plenty of bespoke features to offer. Some software developers, such as Playtech, have even opted for linking their DC Comics slots to progressive jackpot networks to attract a greater number of players with the games’ gargantuan prizes. If you are looking to find out more about the features of DC Comics slots, their jackpots and which the most popular titles from these series are, we recommend you take a quick look at the following article. CryptoLogic is among the first respected software suppliers to obtain a license from DC Entertainment in 2009, allowing the company to develop slot games based on the stories from the popular comic series. The titles in question are truly state-of-the-art creations, especially when it comes to graphics, sounds, and gameplay. The visuals are superb, to put it mildly, and correspond to what one would expect to see on the pages of a comic book in terms of style. The fantastic sound effects further add to the entertainment value of the slots since they allow players to fully immerse themselves in their gaming experience. The slots from CryptoLogic’s DC collection are suitable for all players thanks to the intuitive interface that furthers easy and convenient navigation. The games are exceptionally well-designed and have many lucrative extra features to offer. These include wild and scatter symbols, bonus bets, multipliers, and rounds of free spins. The bonus bets are exclusive to CryptoLogic’s DC Comics slots and are something players are unlikely to see in the slot variations of other software providers. The bonus bets provide players with the opportunity to generate more profits by betting more coins per spin and unlocking additional features. In some CryptoLogic slots, like Batman for example, players can bet only one coin per payline. Thanks to the bonus bet feature, slot fans are enabled to add extra coins to their overall bet which would boost their profits if they land a winning combination on the spin. Some of the bonus features in the developer’s comics slots are available only when the bonus bet functionality is activated. Playtech ranks as one of the most well-known names in the online gambling industry, so it is anything but surprising the renowned developer keeps up to date with the latest trends in the online casino world. Playtech, too, has opted for obtaining a license from Warner Brothers and DC Entertainment – a step which enabled the software supplier to introduce its own line of DC-inspired slot titles to the public. As the games bear the brand name of Playtech, players can rest assured each slot from the developer’s DC Comics collection will impress them with spectacular graphics, superb animations, and smooth gameplay. 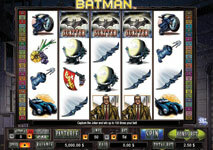 The developer has opted for adapting stories like the Green Lantern, Man of Steel, Batman, and Superman for slot play. Apart from their immense visual appeal, Playtech’s DC slots have other benefits to offer to players. On some of the games, it is possible to trigger unlimited free games as long as you land the bonus symbols on qualifying reels. The player is practically awarded free spins until the multiplier meter (yes, this is another useful feature) lands on “End”. Then again, the games are packed with wilds, scatters, and bonus symbols which trigger lucrative bonus games. But this is not all. Playtech has decided to connect all of its slots, based on the popular superhero series, to a wide-area jackpot network, which is to say fans of DC Comics will not only be able to have a good deal of fun, but can potentially pocket a huge progressive prize in the process. 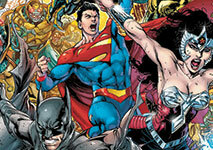 You will be able to read more on how the DC Superheroes jackpots accumulate in the section below. The DC-inspired titles feature five reels and provide players with the option to bet on 25 to 100 paylines, but of course, the exact number varies, depending on which DC slot you choose. After Playtech’s Marvel license expired, the slots from the DC Super Heroes series practically substituted all titles from the Marvel collection offered by online casino operators, running on the respected developer’s software. One of the greatest merits of Playtech’s DC slots is that they, much like the Marvel-based titles, are all linked together in a progressive jackpot network that runs across all casinos operating on Playtech’s software. That is to say, each bet made on any of the DC Super Heroes slots contributes with an increment to the overall prize pool, which allows the pot to get rather impressive in size. Some of the titles that are linked to the jackpot network include Green Lantern, Man of Steel, Superman the Movie, Superman II, Batman and the Riddler Riches, Batman and the Joker Jewels, and Batman and Catwoman Cash, among several others. The RTP of Playtech’s DC Super Heroes slots is a bit lower when compared to some other titles on the developer’s catalog as it ranges between 94.95% and 96.09%. This is to say that each time someone makes a bet on one of these DC slots, a small increment from their bet is deducted. About 0.99% from each wager goes towards the current progressive prize while a smaller portion of the bet feeds the base amount or seed. Whenever someone is lucky enough to land the pot, the prize pools begin accumulating again from a base amount so that players are still incentivised to wager on the progressive games. The slots from Playtech’s Super Heroes jackpot network hold great appeal for reel lovers because they have not one but four progressive prizes attached to them, namely the Grand, Major, Minor and Mini jackpots. Each of the four jackpots seeds at a different base amount and both the seed and the pot values are in EUR. This means that if you hit one of the four prizes, its value will be converted to your local currency depending on the current exchange rates for the day. Note that it is only possible to win one jackpot at a time. The prizes are triggered at random and can be won on any spin, regardless of the amount players have bet. However, making a higher bet increases one’s chances of unlocking the jackpot game. Those who succeed in triggering the said game are guaranteed to collect one of the four prizes. Players will then be required to pick one of four matching jackpot symbols, each one corresponding to one of the four progressive prizes. You are given a specific amount of time to reveal the symbols since Playtech’s DC Super Heroes slots have a reaction timer attached to them. If you fail to click the symbols in the designated time, you will be awarded one of the four prizes at random. All players betting on the progressive titles are required to contribute with a “fee” in order to become eligible for the pot. Unlike progressive table games, where this contribution comes in the form of a side bet, here the “fee” that qualifies you for the colossal prize is built into the payout percentages of the jackpot slots. The DC Comics series pose as a great canvas for casino software developers to work with, with Playtech, CryptoLogic and Microgaming being among the most well-known software suppliers to have created slot variations, based on the DC stories. If interested in giving the DC slots a few spins, we suggest you take a peek at our overviews of five of the most popular titles inspired by everyone’s favorite superheroes. This is a 5-reel, 50-payline slot, developed by one of the most prominent software suppliers in the online gambling industry, CryptoLogic. Players on a budget by no means should be discouraged by the great number of paylines, because these are adjustable and one gets to choose which ones to activate and bet on. What is more, CryptoLogic caters to the needs of players with different bankrolls as they can bet anywhere between $0.50 and $1,000. The visuals of the slot come shockingly close to what one would expect to come across when reading a comic book, which is something DC Comics fans will greatly appreciate. The fantastic extra features the game comes with further improve its entertainment value. The Batman wild is among the most profitable symbols as it substitutes for all other symbols (except for the scatter) whenever it lands on the second, third or fourth reel. The Bat Signal functions as a scatter and when combined with Commissioner Gordon on reels one and five, it activates the Batman re-spins feature. The second bonus feature, Descent into Madness, is triggered whenever players activate the Bonus Bet functionality and land three or more scatters from left to right on the reels. If you are a fan of both slots and Clark Kent, you will greatly appreciate the efforts and creativity the developers at Playtech have invested into this superb 5-reel slot, which comes with 25 paylines you can bet on. Please note that the game is based on the 2013 movie and not on the graphic novels some of you might remember from the mid 1980s. Because of this, the Man of Steel slot impresses with a more modern feel than that of the slots from Playtech’s Batman series. Favorite characters like Superman, Perry White, General Zod, and Jonathan Kent appear as symbols on the reels. Superman and his nemesis Zod are actually walking wild symbols, with each of the two “walking” in a different direction across the screen. In addition, players get to enjoy two bonus features. If the walking Superman and Zod wilds “meet” on the reels, they trigger the Battle for Earth free spins, in which case the players will benefit from four additional wild symbols during the bonus round. The Krypton bonus game is of special interest – once it gets activated, the reels actually get bigger and the number of paylines increases from 25 to 50. 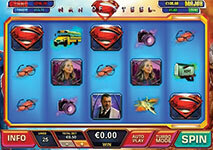 The game attracts players with its massive winning potential as it is actually linked to Playtech’s Super Heroes jackpot network, along with the rest of the DC Comics-inspired titles of the brand. To boost their chances of bagging one of the four progressive prizes, players are recommended to increase the amount of their bets. Fans of Playtech slots are in for a nice surprise as the developer offers them a fantastic opportunity to collect nice payouts on its DC-inspired Green Lantern slot while at the same time enjoying themselves to the fullest. This 5-reel slot is based on the critically acclaimed motion picture of 2011 and utilizes the lucrative 243 Ways to Win format, which is to say there are no paylines as such. Players can potentially generate even more winning combinations since they simply need to align several matching symbols on adjacent reels in order to earn a payout. The graphics and animations are stunning, to say the least, and this is anything but surprising, considering the game bears the brand name of Playtech. The betting range is rather flexible, with players being able to wager anywhere between 0.01 and 50.00 per spin. The game comes with a number of perks, including stacking wilds, the collapsing symbols functionality, multipliers on winning rounds, and free spins. 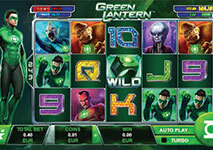 The main attraction of the Green Lantern slot, however, are the four progressive jackpots it is linked to. The biggest of those is the Grand jackpot which starts seeding at a base amount of €200,000 to reach seven-figure sums. 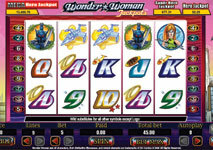 Wonder Woman is an engaging DC-inspired slot, courtesy of software developer CryptoLogic. This is a 5-reel slot, with 50 adjustable paylines and diverse betting options as players get to wager anywhere between 0.01 and 20.00 per line. The graphics are styled to resemble something one would expect to see in a comic book. The Wonder Woman symbol is the wild in this game and appears specifically on the second, third, fourth and fifth reels to help players form more winning combinations. Three or more wilds on the qualifying reels result in players earning 8 free spins. The Wonder Woman symbol becomes a sticky wild and remains in place during the rounds of free spins. There are also scatter and bonus symbols with the Wonder Woman logos. Two or more scatters appearing on the reels will reward players with an instant payout while if one succeeds in hitting at least three scatters on a spin, the Ares bonus game will be triggered, allowing lucky players to collect a top prize of 100 times their payline bets. Slot fans have software developer Microgaming to thank for this enticing 5-reel slot which features a total of 20 adjustable paylines. The software giant has used the original graphic novel as a foundation for this DC Comics slot, which becomes evident by the game’s graphics and feel. 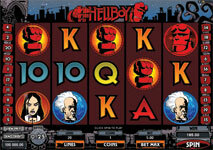 Some of the characters that make an appearance on the reels as symbols include Elizabeth Sherman, Johann Kraus, Kroenen, and of course, Hellboy himself, who is among the highest-paying symbols in the game. This slot has plenty of perks to offer in terms of extra features, including a wild and a scatter symbol. Supermode is another lucrative functionality which is triggered at random to award players with 10 free spins. The Underworld bonus game is unlocked by at least three scatters. Players who unlock this feature can collect additional prizes by choosing from five tunnels. Each correct guess enables players to move on to the bonus game’s next level until they eventually get to the Chamber of Fire where a massive bonus prize awaits them.